Western North Carolina was home to many Grant families, almost all of whom were related to each other (whether they knew it or not.) 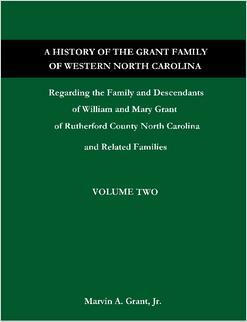 I have documented the family of William and Mary Grant who came to Rutherford County, North Carolina from Virginia before the Revolutionary War. They are the ancestors of a huge number of Grants who settled in various parts of Western North Carolina and Eastern Tennessee as well as many other states. Volume One contains all the known descendants of William and Mary (---) Grant. Volume Two contains information on other Grant families in the area as well as information on related families of Mackey, Bradley, Morris and Dalton. Each family line traced down to the present day when possible. Pages: Vol. I: 676; Vol. II: 160. Click here to find this book in a library near you. You may order from the publisher and pay via Credit Card, Debit Card or PayPal. They do not accept cash, check or money orders. Click below to order online or to preview the book. Use the same buttons to purchase as a download. Unfortunately the books can't be purchased as one combined item, so if you want both, you'll have to put them into your cart separately. If you wish to pay by check or money order you must order it from me via snail-mail. Send the money to me at: Marty Grant, 3291 Alton Phillips Road, Kinston, NC 28504. The price for snail-mail orders includes shipping and handling. Once your check has cleared I will order the book(s) for you and have it shipped to your address. Volume I by itself: $36.00, Volume II by itself: $20.00, both volumes: $56.00. Copyright © 1996 - Marvin A. Grant, Jr. All Rights Reserved.